For the hardy folk wintering on boats, it's always a beautiful day in the watery neighborhoods of Maine. 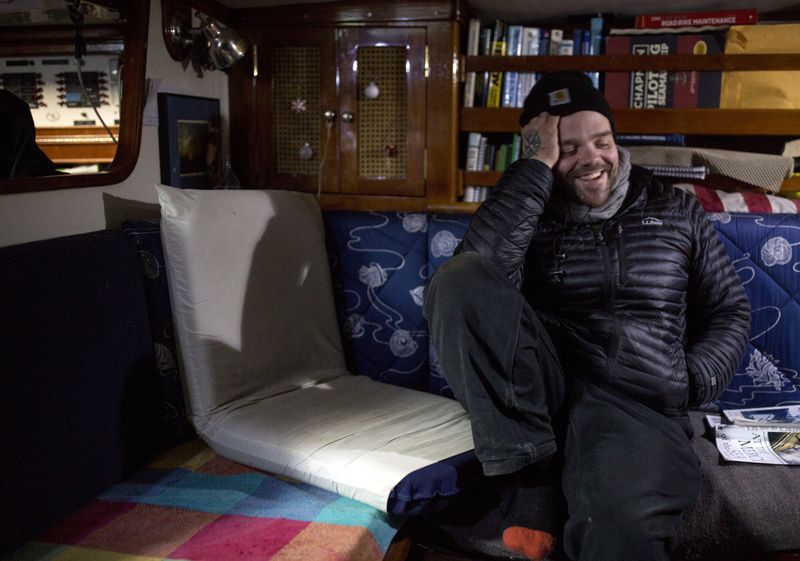 It's wintertime and the living can be easy for Adam Prokosch, who dwells with wife Morgan and a cat aboard their 40-foot Gulfstar sailboat. The Traumerei is docked at South Port Marine on the South Portland waterfront. SOUTH PORTLAND — Adam Prokosch leaned over to add another block of wood to the small stove in his living room. The glow cast a warm light on the bookshelf behind Prokosch’s seat. Nearby, a black-and-white cat prowled. The scene would be ordinary in many households, except that Prokosch’s house is actually a 40-foot-long Gulfstar sailboat docked at South Port Marine in South Portland. Prokosch and his wife, Morgan Diederichs, are among the small but growing community of people who weather Maine’s winter on the water. This season has tested both liveaboards and landlubbers. Even before the first week of January brought a blizzard and subzero temperatures, December was colder and snowier than normal. The average temperature in December was 23.3 degrees in Portland, 5.5 degrees below normal and the coldest since December 1989, which set the all-time record with an average temperature of 14. A total of 21.4 inches of snow fell in Portland in December, 8.3 inches above normal. The Traumerei came with a blue canvas wrap for winter that its residents refer to as “pajamas.” Even when the mercury drops below zero, as it’s been doing, the living space is said to be comfortable, even toasty. But even after Thursday’s blizzard dumped another foot of snow on Portland, Prokosch said the couple don’t have second thoughts about their choice of lodging. At South Port Marine, there are seven liveaboards. At DiMillo’s Marina in Portland, there are 58 – up from 36 last year. Amanda St. Peter, dockmaster at DiMillo’s, said the storm didn’t faze the floating neighborhood. The marina has only evacuated once in her memory, during the Patriot’s Day storm in 2007. St. Peter said that nor’easter blew an easterly wind that rattled the boats, while the northerly gusts from Thursday’s storm passed over them more easily. “It’s just business as usual for us,” St. Peter said. At South Port Marine, freezing temperatures this winter have meant more ice around the docks. The staff at the marina uses a boat to break up the floes, but Prokosch still returned Tuesday from a family trip to find 4 inches of ice around the Traumerei. 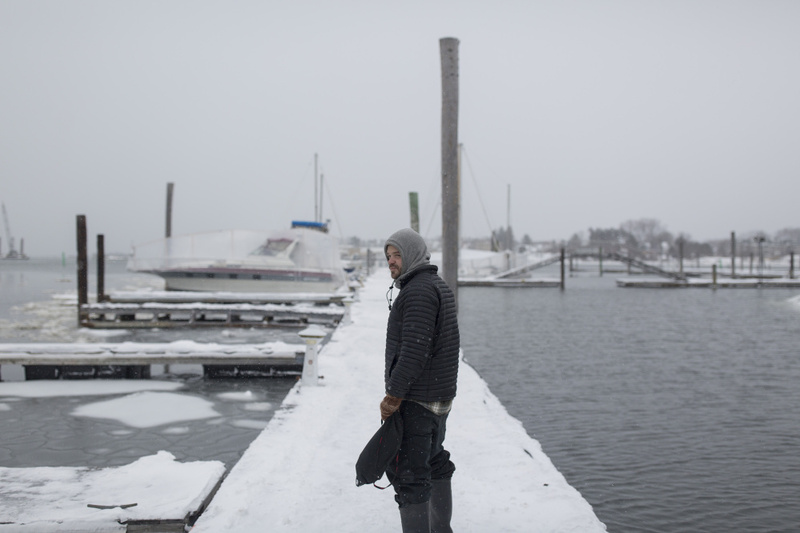 The early winter’s subfreezing temps have meant more ice around the docks of South Port Marine in South Portland, but it’s yet to faze Adam Prokosch, who walks the docks to ensure the other boats are faring as well as his Traumerei. 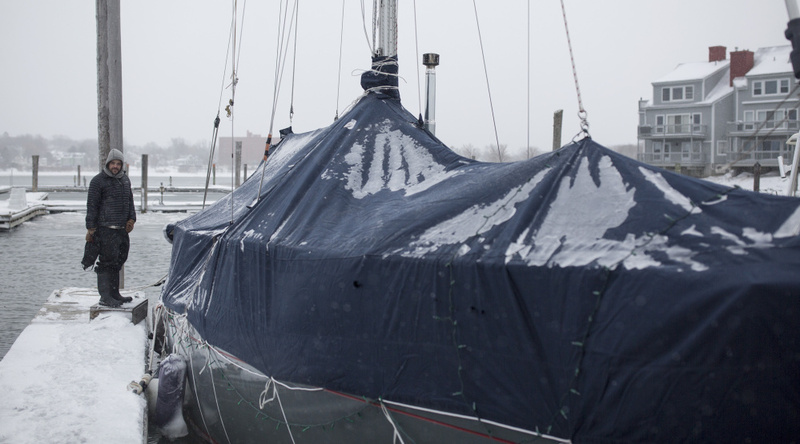 Many liveaboards choose to shrink-wrap their boats in the winter, which adds storage space and helps contain heat. The Traumerei came with a blue canvas wrap for winter that Prokosch calls “pajamas.” Even when the temperatures drop below zero, he said the living space is warm enough. He has both a wood stove and a propane heater. “Even making a cup of tea on the stove top heats it up in here,” he said. Prokosch is originally from Washington state and spent a decade working on sailboats. He met his wife while they were both working on a sailboat in California. In 2012, he was part of the 16-member crew of the HMS Bounty, which sank off the coast of North Carolina during Hurricane Sandy. The Coast Guard rescued 14 people; two died. Prokosch broke his back but recovered. The tall ship had been docked in Boothbay Harbor before the sinking, and the young couple had liked the people in Maine. Prokosch and Diederichs came north to work and sail. Despite his near-death experience on the Bounty, Prokosch said he doesn’t mind bad weather on the water. He walks the docks during storms to make sure the other boats are secured properly. He said he wasn’t afraid of the rocking of the boat during Thursday’s blizzard because it reminded him of the open sea. He described storms as the game he practiced for every day. Still, winter in the marina can be treacherous and challenging. Last year, Prokosch said his wife slipped off the dock but was able to pull herself out of the water. A pipe under the sink on the boat burst. Prokosch’s bicycle fell into the water, and he had to haul it up from the depths during low tide. In years past, the couple traveled to see family in the winter. Diederichs works at the marina in the warmer months and visits her family in Minnesota in the colder months. Prokosch works year-round at Bath Iron Works. Two years ago, they decided to stay on the boat for economic reasons. They spent their first winter at DiMillo’s, then moved to South Port when Diederichs got her job there. 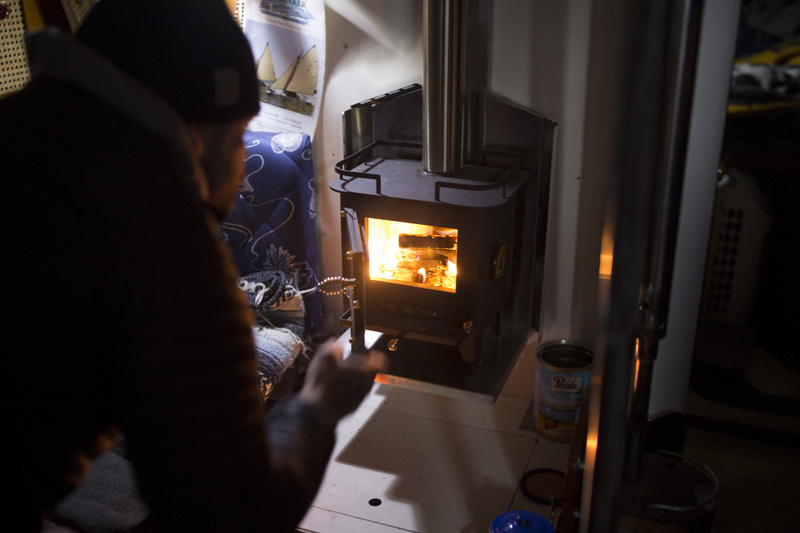 Multiple sources of heat, including a wood stove, are keeping the Traumerei’s liveaboards comfortable despite the colder-than-usual winter that’s just a couple weeks old. Docking at the South Portland marina in the winter costs $70 per foot, plus a $300 liveaboard fee for the season. That’s about $3,100 for a boat the size of the Traumerei, a deal compared to several months’ rent in Portland. Prokosch is already planning his next trip – a journey around Nova Scotia and through Canada to the Great Lakes. When they leave Maine, it won’t be the cold that sends them sailing. “I love it here, but I’m a traveling guy,” he said.